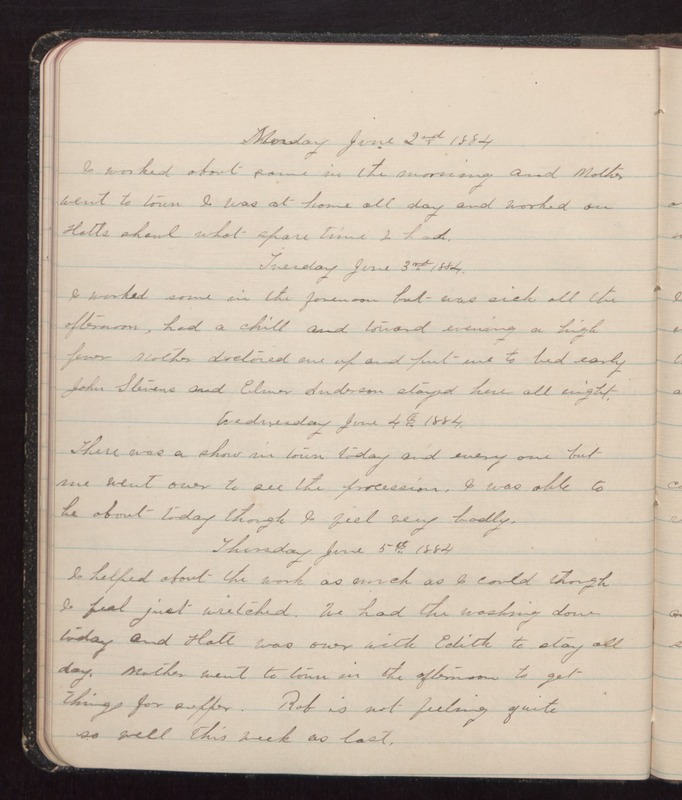 Monday June 2nd 1884 I worked about some in the morning and Mother went town I was at home all day and worked on Hatts shawl what spare time I had. Tuesday June 3rd 1884. I worked some in the forenoon but was sick all the afternoon, had a chill and toward evening a high fever Mother doctored me up and put me to bed early John Stevens and Elmer Anderson stayed here all night. Wednesday June 4th 1884. There was a show in town today and every one but me went over to see the procession. I was able to be about today though I feel very badly. Thursday June 5th 1884 I helped about the work as much as I could though I feel just wretched. We had the washing done today and Hatt was over with Edith to stay all day. Mother went to town in the afternoon to get things for supper. Rob is not feeling quite so well this week as last.